Adding trim to our garage door. Having had lived in two brand new homes before moving in to this 1970’s rambler has been quite an adjustment. When you live in a brand new home any changes you make are usually cosmetic decorating only. When you move in to an older home, everything needs replacing and updating. 2 years ago this houses garage door looked like this. As much as I would love to replace it there are other things like piano lessons, school lunch, baseball cleats, etc. that are taking precedence at the moment. It works just fine…just not very pretty to look at. Over the past two years we’ve been making small changes to improve the look of the exterior. Then added a coat of primer and paint but still something was missing. So I set out to add some trim to the existing windows. For under $20.00 I was able to purchase some wood trim (3/4 inch wide by 1/2 inch deep) from Home Depot. Using my miter saw I measured and cut each piece for each window. Then used some Exterior Liquid nails and glued the trim right on to the windows. Using just enough glue was quite a science. Wiping down the smudges proved even more tricky. After it dried I used a razor blade to scrape off any excess glue. This little level has been one of my most valued tools in my tool box. I made sure everything was even and level. Voila. $20.00 and 3 hours later I added trim to our 30+ year old garage door. Eventually this very old door may go in to retirement but until then…the trim prosthetic will have to suffice. Warm Weather = Time To Paint! Thanks to global warming Salt Lake City got up to 68 degrees this past week. I wasted no time and got my hiney outside to work on projects. My friend found this huge board at Habitat For Humanity. It was so heavy it required two people to lift it. My Mr. ripped it down the middle to create two boards. The wood was weathered and in rough shape. The more I sanded the more it started to flake of in chunks. I decided to see if I could find a commercial mill to plane the boards for me. If you’re not familiar with a wood machine planer it’s a tool that shaves and smooths a board. I found Intermountain Wood who said they would do it for $30. Sold. They will do small projects but they specialize in all types of wood for flooring, wood plank walls, trim and large planks like mine. It was a wood candy-land. A quick planing left my boards smooth like buttah. Such a difference, right?! I stained them both Special Walnut by Minwax. I then applied two coats of Waterlox. Once they were dry I “pretty-please-d” my man in to attaching these 15″ hairpin legs for me while I ran outside to start on my next project. I gifted this bench to my friend who found me the board but just wait to see what I do with the other board. (Thank you Lisa)! The next projects I tackled was painting this dresser and nightstand that have been sitting in my cold garage all winter. I used Amy Howard’s Chalk Paint and had it tinted this Navy Blue called “Cadet Song” by Valspar. Amy Howard brand is the only chalk paint I’ve found that you can have tinted to whatever color you want at Ace Hardware. Of course the beauty of chalk paint is that it requires no prep in terms of sanding or priming so I simply rolled and brushed the paint right on. Two coats later and the pieces were covered. The downside of chalk paint is that it is quite flat and porous in terms of sheen so sealing is highly suggested. Most chalk companies also sell a wax you can buff on but I prefer applying two coats of Polyurethane. My go to is Varathane’s No Odor, Indoor. New coat of paint, new knobs and they’re ready for a new home. They weren’t matching to begin with but you’d never know now. My dream house plus $500. to use towards new windows. The other day I was perusing one of my favorite neighborhoods and I ran smack in to my house soul mate. This house ticks all my boxes. It’s a modest house in an adorable neighborhood bursting with curb appeal (which probably costs a fortune due to the location). It’s sort of mix of traditional with a hint of modern. And that door…gah! The gray blue is not a typical front door color but it’s fabulous. None of the houses on the street are identical clones of each other which I adore. It’s on a tree lined street and it looks like the kind of neighborhood where people borrow sugar from their neighbors and probably don’t lock their front doors. There’s lots of things that make this house special but one of the details I can’t stop admiring are the windows. The don’t show up extremely well in the pictures but I think the black trim detail is stunning. I’m pretty certain they were just replaced because the old ones are stacked and still leaning up against the other side of the house. If I drive by this house one more time I’m pretty sure the owners will call the police and have me arrested for stalking. When I approach a design project, windows are not normally the first thing I consider changing out. It’s a frame and glass, right? How much impact can they make? From an efficiency standpoint…good, quality windows can make all the difference in the world. From a design standpoint…it can mean the difference between “meh” and “wow-zah”! This window is off our garage and even though it doesn’t have huge importance it bugs me every time I look at it. It’s such an eye sore and needs replacing. I was recently introduced to Integrity’s Ultrex Fiberglass Windows and Doors. From what I learned they are highly efficient and super durable. In fact, on their website they showed a hockey team shooting pucks in the windows as evidence (perfect for a house full of men). I’ve been thinking about replacing it with one of their Glider or Casement style windows. If you have some windows in your home that need replacing this is your lucky day! Integrity Windows is giving $500. that could be used towards replacing your old windows! All you have to do is visit Integrity Windows and find your local Integrity dealer. Then leave a comment on this post with your closest location along with what windows or doors you would like if you were remodeling your home. It’s that easy. 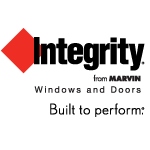 Learn more about Integrity windows and doors or visit them on Facebook or on Twitter.